Stephan Eirik Clark’s debut novel centers on David Leveraux, a man with a gift of taste. 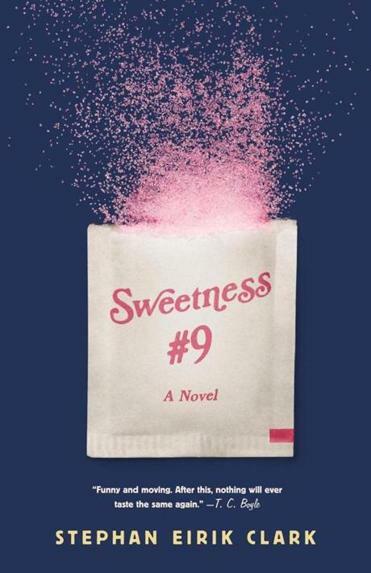 If the best social satire makes the bitter pill of truth easier to swallow, “Sweetness #9” coats it with something better than sugar. This debut novel by Stephan Eirik Clark shows up our national obsession with instant gratification as both poisonous and desirable, and very, very funny. David Leveraux has the gift of taste. As “Sweetness #9” opens, it is 1973 and the young Leveraux is about to embark on a career as a flavorist, a chemist who labors not to duplicate but to better the flavors that consumers crave. The 24-year-old is well suited for this field, since he has the ability to discern the elements that give a food its unique zing down to the smallest particle. More important, perhaps, he still remembers the deprivation of post-war rationing in his native England. Untouched by the social revolutions of the 1960s, he now seeks only to break down desired flavors in order to make the perfect orange, the perfect pot roast, the perfect butterscotch for the masses. But Leveraux is also haunted by mortality. When not in his lab, he reads tabloid reports about the “World’s Oldest Man” and attempts to duplicate that man’s diet, whether it is the fish of a “stolid Norwegian immigrant” or, once that person dies, the squid, octopus, and sweet potatoes of a centenarian Okinawan. So when his research reveals possibly dangerous side effects for his company’s new product — the sugar substitute of the title — Leveraux resolves to act. However, his attempts to expose the potential blockbuster go awry. First his results and then his sanity are cast in doubt. Ultimately, in order to return to his own personal sweet spot — employment in his chosen field, with a happy and shapely wife — he must do his best to forget what he has learned and labored on, mixing chemicals for human consumption until the truth can no longer be denied. Clark peoples this bittersweet tale with a madcap cast of characters. More American than any native-born citizen, Leveraux is a solid Reagan conservative, in love with his candy-colored (and flavored) version of the American dream. His wife, Betty, is a Sweetness #9 addict, whose weight balloons and recedes as she moves from fad diet to fad diet and from Jane Fonda aerobics to kickboxing to retain her sorority girl figure. The superficial couple get the children they deserve: Priscilla, who becomes a vegan activist, and Ernest, who puts red dye in everything he eats, with bizarre results. Add in a conspiracy-theorist colleague and an odd new boss, Ernst Eberhardt, who worked as Hitler’s flavorist, and the complications become inevitable. In lesser hands, this over-the-top satire could be too much. Clark, however, is enough of a stylist to make it work. Some of his best lines are simply slipped in. Leveraux is merely recalling his new boss’s meteoric rise in their field, for example, when he relates the quip that made him famous: “Serve? I didn’t just serve in the war,” Eberhardt had told an interviewer years before, “I served Hitler his dinner!” At other times, Clark’s satire is almost too subtle. A trade convention where someone is hailed as “the Gorilla of Vanilla” and someone else discusses farming protein “from waste effluent” is nearly believable. This is a hard mix to sustain, and at times the energy level does flag. Betty’s weight regimen shifts once too often, and David’s obsession with Communism begin to wear. Still, as Clark steers his oddball crew toward its inevitable blowup, he builds a sort of sympathy for the poor flavorist. After his dreams have proved both prophetic and poisonous, David Leveraux is ultimately a man alone trying to capture the savor of life. Clea Simon is the author of 14 mysteries. She can be reached at cleas@earthlink.net.